Talar fractures are uncommon injuries, whose outcome is often characterized by the onset of serious complications. The aims of the present study are: 1) to review the available evidence concerning the outcome and complications of talar neck fractures; 2) to describe the clinical results and the rate of post-op complications in a series of patients treated surgically after talar fracture-dislocations. 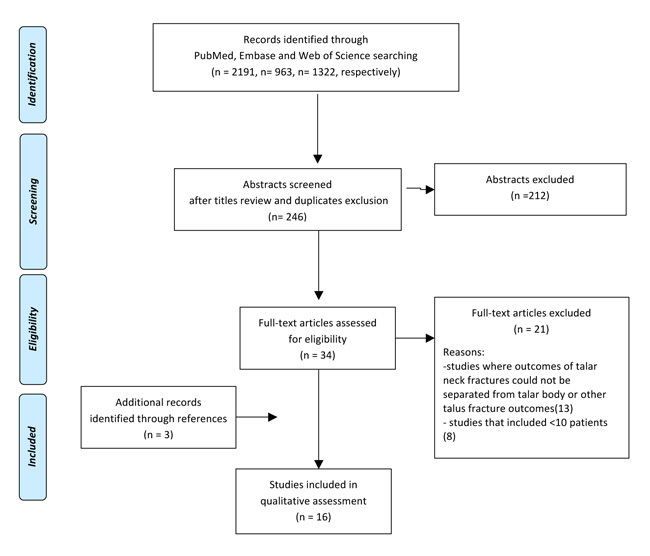 The review of the literature was performed on the Pubmed, Embase and Web of Science databases and aimed at identifying clinical trials with at least 10 patients and dealing with surgical management of talar fracture-dislocation (Hawkins grade II to IV). All the papers were analyzed to extract data concerning common complications such as non-union, mal-union, infection, osteonecrosis and osteoarthtritis. The clinical arm of this paper included 26 patients (19 men and 7 women), who underwent fixation of displaced talar fracture by cannulated screws and were retrospectively evaluated, both clinically and radiographically, at a mean 51.2 ± 23.4 months of follow-up. The evaluation through the AOFAS score revelead a loss of functional performance with respect to the pre-injury status. Four patients were re-operated within final follow up, whereas the remaining 22 presented excellent results in 2 cases, good results in 4 cases, fair results in 11 cases and poor results in 5 cases. Osteoarthritis and osteonecrosis incidence were 51.9% and 25.9% respectively. Sixteen studies were included in the review and it was confirmed that the most frequent complication was post-traumatic OA, followed by osteonecrosis and mal-union. A variable range in percentage of complications described should be ascribed to the low quality of trials currently available. Displaced talar fracture are challenging to treat and the outcomes at middle-term are often modest. Looking at complications, the present case series and the review of literature revealed that the most common one is peritalar OA. Osteonecrosis, traditionally regarded as the most fearsome adverse event, is relevant but less frequent than OA. Keywords: Talus, Talar fracture, Osteonecrosis, Osteoarthritis, Complications, Review. © 2018 D. et al. Talar fractures are uncommon injuries, often occurring after a high energy trauma associated with forced ankle dorsiflexion and axial load [1Buza JA, Leucht P. Fractures of the talus: Current concepts and new developments. Foot Ankle Surg 2017 Apr 24.. pii: S1268-7731(17)30086-3. doi: 10.1016/j.fas.2017.04.008. [Epub ahead of print] Review. PubMed PMID: 29409210.]. It has been documented that talar fractures represent about 2.5% of all fractures seen in Emergency departments, the most commonly site involved being the talar neck (almost 50% of all cases), followed by talar body [2Vallier HA. Fractures of the talus: State of the art. J Orthop Trauma 2015 Sep; 29(9): 385-92. [http://dx.doi.org/10.1097/BOT.0000000000000378] [PMID: 26299809] ]; despite being a rare condition, the treatment is always challenging: conservative approach by bracing is possible only in case of undisplaced fractures, whereas in the majority of cases it is required surgical intervention to reduce and stabilize the fracture [3Shakked RJ, Tejwani NC. Surgical treatment of talus fractures. Orthop Clin North Am 2013 Oct; 44(4): 521-8. [http://dx.doi.org/10.1016/j.ocl.2013.06.007] [PMID: 24095068] ]. In most cases, this kind of injuries are associated to poor clinical outcome, with a high rate of serious post-op. complications. The most feared of them is avascular osteonecrosis (ON), whose onset is related to the vascular damage following displaced fracture [2Vallier HA. Fractures of the talus: State of the art. J Orthop Trauma 2015 Sep; 29(9): 385-92. [http://dx.doi.org/10.1097/BOT.0000000000000378] [PMID: 26299809] , 4Hawkins LG. Fractures of the neck of the talus. J Bone Joint Surg Am 1970; 52(5): 991-1002. [http://dx.doi.org/10.2106/00004623-197052050-00013] [PMID: 5479485] , 5Canale ST, Kelly FB Jr. Fractures of the neck of the talus. Long-term evaluation of seventy-one cases. J Bone Joint Surg Am 1978; 60(2): 143-56. [http://dx.doi.org/10.2106/00004623-197860020-00001] [PMID: 417084] ]. Talar vascular supply is provided by branches from tibialis anterior, tibialis posterior and peroneal arteries [6Wang Z, Qu W, Wang D, Zhou Z, Yu M, Zhou D. Talar neck fractures: Anatomic landmarks of suitable position for posterolateral screw insertion. Acta Orthop Traumatol Turc 2015; 49(3): 326-30. [http://dx.doi.org/10.3944/AOTT.2015.14.0089] [PMID: 26200414] ] and high energy trauma is responsible for a severe impairment of talar vascularization: Leland G. Hawkins in 1970 originally estimated a rate of avascular ON of 42% in Type II talar neck fracture, with an increase up to 91% in case of Type III fractures [4Hawkins LG. Fractures of the neck of the talus. J Bone Joint Surg Am 1970; 52(5): 991-1002. [http://dx.doi.org/10.2106/00004623-197052050-00013] [PMID: 5479485] ]. Currently, there are available only a few clinical trials describing the clinical outcome and the complications’ rate following surgical treatment of displaced talar fracture, and the overall findings suggest that early and delayed sequelae seems almost unavoidable [7Jordan RK, Bafna KR, Liu J, Ebraheim NA. Complications of talar neck fractures by hawkins classification: A systematic review. J Foot Ankle Surg 2017 Jul - Aug; 56(4): 817-21. [http://dx.doi.org/10.1053/j.jfas.2017.04.013] [PMID: 28633784] ]. In particular the clinical relevance of ON is peculiar, since it is responsible for severe functional limitation and often requires more sacrificing procedures such joint fusion [8Abd-Ella MM, Galhoum A, Abdelrahman AF, Walther M. Management of nonunited talar fractures with avascular necrosis by resection of necrotic bone, bone grafting, and fusion with an intramedullary nail. Foot Ankle Int 2017; 38(8): 879-84. [http://dx.doi.org/10.1177/1071100717709574] [PMID: 28587485] ]. However, the limited number of trials published up to now, often with a small number of patients, demands for further data to confirm these highly unfavorable complications rate. The aims of the present manuscript are: 1) to review the available evidence concerning the risk of post-op complications that should be realistically expected following reduction and internal fixation of these challenging fracture; 2) to describe the clinical outcome and the rate of post-op complications in a series of homogenous patients treated surgically after talar neck fracture-dislocations (Hawkins grade II-IV), comparing the results obtained with those documented in the available literature. Screening process and analysis were conducted separately by 2 independent observers (SC and DL). First, the articles were screened by title and abstract. The following inclusion criteria for relevant articles were used during the initial screening of titles and abstracts: clinical reports of any level of evidence, published in the last 30 years, written in English language, dealing with the surgical treatment of talar neck fractures (Hawkins grade II to IV) [9Alton T, Patton DJ, Gee AO. Classifications in brief: The hawkins classification for talus fractures. Clin Orthop Relat Res 2015; 473(9): 3046-9. [http://dx.doi.org/10.1007/s11999-015-4136-x] [PMID: 25586336] , 10Vallier HA, Reichard SG, Boyd AJ, Moore TA. A new look at the Hawkins classification for talar neck fractures: Which features of injury and treatment are predictive of osteonecrosis? J Bone Joint Surg Am 2014; 96(3): 192-7. [http://dx.doi.org/10.2106/JBJS.L.01680] [PMID: 24500580] ], and including at least 10 patients. Exclusion criteria were articles written in other languages, reviews, or studies analyzing other pathological conditions (including talar process or talar body fracture). In the second step, the full texts of the selected articles were screened, with further exclusions according to the previously described criteria. Moreover, the articles not reporting clinical or radiologic results were excluded. Reference lists from the selected papers were also screened. A flowchart of the review is provided in Fig. (1 ). Relevant data were then extracted and collected in a unique database with the consensus of the two observers to be analyzed for the purposes of the present manuscript. Twenty-six patients (19 men and 7 women, mean age 41.3 ± 9.4 yy) were included in this retrospective analysis. All patients were admitted at the Emergency Department of a highly specialized Level I Trauma Center and suffered for talar neck fracture (grade II-IV according to Hawkins). Patients presenting with undisplaced fractures, or with isolated talar body or talar processes fractures were excluded from the present analysis. In one case a bilateral talar fracture occurred, in 9 cases the fracture was open. The fractures were classified according to the Hawkins classification as follows: 14 grade II, 11 grade III, 2 grade IV. All patients underwent surgical treatment: in 18 cases open reduction and internal fixation was performed within 24 hours from the hospital admission, whereas in the remaining 8 cases a delayed fixation (at mean 11.8 ± 5.3 days after the trauma) was performed due to exposure of the fracture or to other associated life-threatening conditions that required priority treatment. All the patients underwent CT scan prior to surgery in order to better plan the fixation strategy (Table 1). Flowchart resuming the papers’ selection process for the literature review. Demographics of patients included in the clinical trial. All patients were treated by open reduction and internal fixation with titanium cannulated screws. The surgical approach varied depending on the specific fracture pattern. A single medial approach was used in most cases. In 7 patients presenting a dorsomedial comminution, a second anterolateral approach was used to better visualize the fragments and to obtain an anatomic reduction. After surgery all patients were placed into a brace that was kept for about two months. After one week, active ankle mobilization was started, as toleraed by the patient, to prevent joint stifness. Progressive weightbearing was allowed after 8 weeks and full weightbearing regained approximately after 10 weeks. Patients were evaluated clinically one year after the surgical procedure and then at a mean 51.2 ± 23.4 months of follow up by using the Italian version of the American Orthopaedic Foot and Ankle Score (AOFAS) for assessing the overall function of the foot and ankle district. Furthermore patients were also evaluated radiographically with standard antero-posterior and lateral X-rays, to assess the eventual onset of post-traumatic OA, avascular osteonecrosis, non-union, delayed union, malunion and other complications. Data concerning post-operative adverse events have also been documented. All continuous data were expressed as mean and standard deviation; categorical variables were expressed as frequency and percentages. The Wilcoxon non-parametric test was used to test the differences at different follow-up times. The Mann- Whitney nonparametric test was performed to assess between-group differences of continuous data. The Spearman rank correlation was used to assess correlation between rank and continuous data, and the Kendall tau ordinal correlation was used to assess correlation of ordinal data. Fisher’s chi-square test was performed to investigate the relationships between dichotomous variables. Pearson’s chi-square test evaluated by exact methods for small samples was performed to investigate the relationships between grouping variables. All nonparametric tests were evaluated by exact methods for small samples. For all tests, P<.05 was considered significant. All statistical analysis was performed with SPSS, version 19.0 (IBM, Armonk, New York) [11Filardo G, Kon E, Di Matteo B, Di Martino A, Marcacci M. Single-plug autologous osteochondral transplantation: Results at minimum 16 years’ follow-up. Orthopedics 2014; 37(9): e761-7. [http://dx.doi.org/10.3928/01477447-20140825-51] [PMID: 25350617] ]. Despite an overall positive outcome after surgical treatment, the evaluation through the AOFAS scores revelead a significant loss of functional performance with respect to the pre-injury status: in particular, the one-year mean AOFAS score was 78.3 ± 14.2, which was significantly lower than the pre-injury value that was estimated in 96.7 ± 12.3 (p< 0.001). At the final evaluation a slight, although not significant, decrease occured to 71.3 ± 15.7 (p= n.s.). In particular, at one year 3 patients reported excellent results (AOFAS more than 90/100), whereas 8 patients reported good results (AOFAS ranging from 75 to 89), 9 patients fair results (AOFAS from 50 to 74) and 6 patients poor results (AOFAS < 50/100). At final evaluation, a slight worsening was observed: 4 patients were re-operated due to relevant persisting pain and functional limitation, and the remaining 22 presented: excellent results in 2 cases, good results in 5 cases, fair results in 8 cases and poor results in 7 cases. No correlation was found between clinical outcome and timing of surgery. For what regards post-operative complications, in 2 cases a delayed healing of the surgical wound occured due to a superficial infection, which was treated by antibiotic therapy and dressing changes; in two patients a deep infection occurred, which was treated in both cases by irrigation, debridement and antibiotich therapy. Both cases ended up with post-traumatic OA. In terms of radiographic outcome, no non-union was reported in the present series of patients. Delayed union occurered in two patients whereas malunion was documented in 4 cases with varus mal-alignment. Osteonecrosis was detected in 7 out 27 cases (25.9%) and in all cases a negative Hawkins sign was detected at 6-8 weeks following surgery. Five of these patients presented significant pain correlated to ON, with inherent impairment in daily activities (in four cases bone collapse was also observed). Fourteen out 27 cases (51.9%) developed post-traumatic OA as observed at radiographic evaluation: in most cases (9) there was evidence of concurrent subtalar and tibio-talar and OA, whereas in the remaining cases a single joint were involved by the degenerative process. In only 1 case talo-navicular OA was recorded. In 4 cases, within the final-evaluation, fusion procedures were performed in order to relieve pain. The Database search identified 2191 reports on the Pubmed, 963 on Embase, and 1322 on Web of Science. After title screening and duplicates removal, abstracts were checked and selected according to the aforementioned inclusion/exclusion criteria. As shown in Fig. (1 ), a total of 34 full-text articles were assessed for eligibility. Twenty-one articles did not fulfill the inclusion criteria and were further excluded and three studies were included after reference screening, thus leading to a total of 16 studies considered in the final analysis [10Vallier HA, Reichard SG, Boyd AJ, Moore TA. A new look at the Hawkins classification for talar neck fractures: Which features of injury and treatment are predictive of osteonecrosis? J Bone Joint Surg Am 2014; 96(3): 192-7. [http://dx.doi.org/10.2106/JBJS.L.01680] [PMID: 24500580] , 12Bastos LR, Ferreira RC, Mercadante MT. Mercadante Metanalysis of clinical and functional outcome and complication of talar neck fractures. Rev Bras Ortop 2015; 45(4): 362-74. [http://dx.doi.org/10.1016/S2255-4971(15)30382-7] [PMID: 27022565] -26Maceroli MA, Wong C, Sanders RW, Ketz JP. Treatment of comminuted talar neck fractures with use of minifragment plating. J Orthop Trauma 2016; 30(10): 572-8. [http://dx.doi.org/10.1097/BOT.0000000000000601] [PMID: 27082938] ]. All the trials were analyzed for relevant outcomes and data were summarized in Table 2, with a particular attention on reporting the percentage of the common early and delayed complications after surgical treatment of talar neck fracture. As evident by the table, the majority of the trials (15 out of 16) included were retrospective case series with a small number of patients evaluated (<50 patients in 12 out 16 studies), mainly at middle term follow-up (< 5 years in 11 out of 16 trials). Looking at specific complication rates, an overlook at the data extracted from clinical trials revealed that the most common complication was osteoarthritis (both subtalar and tibio-talar), followed by osteonecrosis and then mal-union. The mean percentage of subtalar and tibio-talar OA onset following surgical treatment of talar fracture were 53.2% (ranging from 27% to 87%) and 33.7% (ranging from 8% to 76%) respectively. The rate of ON onset varies from 11% to 59%, with a mean value of 30.2%. The third most common complication is malunion, which, despite not being documented by all authors, reaches an average 24.7% of patients (Table 2). Synopsis of clinical trials published in the last 30 years, including percentage of reported complications. The main finding of the present study is that full recovery after a displaced talar fracture is extremely hard to achieve and, in the vast majority of cases, patients have to face some grade of functional impairment and pain limiting physical activities up to middle term evaluation. 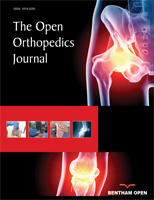 There is a large range of potential complications following surgical treatment, and the most common of them are peritalar osteoarthritis and osteonecrosis: In the present case series, the authors documented 51.9% of post-traumatic OA and 25.9% of osteonecrosis, in line with the data emerged from the analysis of the available evidence. Talar fractures are uncommon injuries, often consequence of high energy trauma, which is responsible of different fracture patterns with different prognosis in terms of clinical outcome. The most challenging conditions are those characterized by a fracture of talar neck (the most common fracture site) and/or talar body, with “peritalar” displacement (tibio-talar, subtalar and/or naviculo-talar displacement) [27Caracchini G, Pietragalla M, De Renzis A, et al. Talar fractures: Radiological and CT evaluation and classification systems. Acta Biomed 2018; 89(1-S): 151-65. [http://dx.doi.org/10.23750/abm.v89i1-S.7019] [PMID: 29350644] , 28Dale JD, Ha AS, Chew FS. Update on talar fracture patterns: A large level I trauma center study. AJR Am J Roentgenol 2013; 201(5): 1087-92. [http://dx.doi.org/10.2214/AJR.12.9918] [PMID: 24147480] ]. The peculiar anatomical features of talar vascularization, characterized by vessels entering from the talar neck and supplying the talar body in a retrograde manner, explain the high risk of post-traumatic osteonecrosis, that has been deemed as the most common and dramatic consequence following a displaced fracture [29Shimizu M, Matsumine H, Takeuchi M. Reconstruction of chopart’s amputation stump using artificial dermis combined with free anterolateral thigh flap. Plast Reconstr Surg Glob Open 2015; 3(11): e558. [http://dx.doi.org/10.1097/GOX.0000000000000547] [PMID: 26893983] ]. Since the first reports on the management of talar fractures, authored by Hawkings [4Hawkins LG. Fractures of the neck of the talus. J Bone Joint Surg Am 1970; 52(5): 991-1002. [http://dx.doi.org/10.2106/00004623-197052050-00013] [PMID: 5479485] ], the threat of ON has always been impending, and looking at the data emerging from “early” literature, the percentage of ON was in most cases more than 50%. Despite several decades have passed, with inherent progress in surgical techniques, equipment and management of soft tissue injuries, the rate of post-traumatic ON is still considerable, as proven by the data emerged from the present review, which focused on clinical trials published in the last 30 years. Anyway, a recent meta-analysis has suggested that surgical managament of talar fractures, which became routine only after 1990, has contributed to reduce the rate of ON, especially in Hawkins II and III neck fractures [30Dodd A, Lefaivre KA. Outcomes of talar neck fractures: A systematic review and meta-analysis. J Orthop Trauma 2015; 29(5): 210-5. [http://dx.doi.org/10.1097/BOT.0000000000000297] [PMID: 25635362] ]. Surprisingly, the present review found a large variability among studies regarding the incidence of post-traumatic ON, with some trials reporting values as low as 10% and others presenting higher incidence, up to 50% of cases. The aforementioned meta-analysis found an overall incidence of ON at about 30%. Anyway, this variability in results among trials may be explained by the overall poor quality of the studies published up to now, which are mainly retrospective with a low number of patients included and follow-ups restricted to mid-term evaluation at variable intervals. Furthermore, due to the intrinsic rarity of talar fractures, studies always included different fracture patterns, thus increasing the number of variables to consider and limiting the possibility of generalizing results to clearly understand the impact of post-traumatic ON. Despite the lack of high level trials with inherent bias in terms of homogeneity of patients and evaluations, a thorough overlook on the complications’ rate is fundamental to provide reliable information to patients suffering from such injuries. The analysis of literature has also revealed several shadows on the prognostic factors of displaced talar fractures, thus fostering further studies in this particular topic of traumatology: For example, it is generally assumed that timing of fixation (early vs delayed) do not correlate with the risk of ON, but actually just a few studies have enquired this specific aspect and, therefore, this issue should not be considered as definitive [31Buckwalter V JA, Westermann R, Mooers B, Karam M, Wolf B. Timing of surgical reduction and stabilization of talus fracture-dislocations. Am J Orthop 2017; 46(6): E408-13. [PMID: 29309454] , 32Grear BJ. Review of talus fractures and surgical timing. Orthop Clin North Am 2016 Jul; 47(3): 625-37. [http://dx.doi.org/10.1016/j.ocl.2016.03.008] [PMID: 27241385] ]. There is no clear evidence whether a fixation technique (screws vs plate vs K wires) is better than the other, nor if there are surgical tricks (e.g. screws placed anterior to posterior rather than posterior to anterior) that could improve clinical outcome [30Dodd A, Lefaivre KA. Outcomes of talar neck fractures: A systematic review and meta-analysis. J Orthop Trauma 2015; 29(5): 210-5. [http://dx.doi.org/10.1097/BOT.0000000000000297] [PMID: 25635362] ]. Similarly, the use of a double surgical approach does not seem to increase the risk of ON with respect to the single access [10Vallier HA, Reichard SG, Boyd AJ, Moore TA. A new look at the Hawkins classification for talar neck fractures: Which features of injury and treatment are predictive of osteonecrosis? J Bone Joint Surg Am 2014; 96(3): 192-7. [http://dx.doi.org/10.2106/JBJS.L.01680] [PMID: 24500580] ]. Therefore, the onset of ON should not be regarded as the major fear, and also taking into account other more common traumatic injuries, such as displaced proximal humerus and proximal femur fractures, even in this cases the reports suggest that incidence of ON is not negligigle and not particularly lower with respect to talar fracture [33Ehlinger M, Moser T, Adam P, et al. Early prediction of femoral head avascular necrosis following neck fracture. Orthop Traumatol Surg Res 2011; 97(1): 79-88. [Review]. [http://dx.doi.org/10.1016/j.otsr.2010.06.014] [PMID: 21087905] , 34Xu J, Zhang C, Wang T. Avascular necrosis in proximal humeral fractures in patients treated with operative fixation: A meta-analysis. J Orthop Surg Res 2014; 9: 31. [http://dx.doi.org/10.1186/1749-799X-9-31] [PMID: 24767176] ]. The key element is fracture displacement in a small bone with a vulnerable vascularization: even in case of a good reduction (which is often a challenge, especially in comminuted fractures), ON should be expected in the follow-up. In spite of all these open questions, the real “villain” when dealing with displaced talar fractures is post-traumatic osteoarthritis, which can be regarded as the main responsible for the poor clinical outcome in most of the cases. Even on this aspect, reports suggests a very variable range in the rate of OA onset, but the reasons may be the same of those mentioned for ON. Anyway, a large number of trials show very high percentage of post-traumatic OA, with peak values of more than 70% [12Bastos LR, Ferreira RC, Mercadante MT. Mercadante Metanalysis of clinical and functional outcome and complication of talar neck fractures. Rev Bras Ortop 2015; 45(4): 362-74. [http://dx.doi.org/10.1016/S2255-4971(15)30382-7] [PMID: 27022565] , 14Fournier A, Barba N, Steiger V, et al. Total talar fracture - long-term results of internal fixation of talar fractures. A multicentric study of 114 cases. Orthop Traumatol Surg Res 2012; 98(4)(Suppl. ): S48-55. [http://dx.doi.org/10.1016/j.otsr.2012.04.012] [PMID: 22621831] ]. This should be also related to the remarkable rate of mal-union, particularly varus mal-alignment, that appears to be the third most frequent complication following surgical treatment of talar displaced fractures. Furthermore, it shoud be noted that the majority of trials investigated the clinical outcome up to mid term evaluation, so a higher incindence of peritalar OA at longer follow-up [17Lindvall E, Haidukewych G, DiPasquale T, Herscovici D Jr, Sanders R. Open reduction and stable fixation of isolated, displaced talar neck and body fractures. J Bone Joint Surg Am 2004; 86(): 2229-34. 18] must be expected. Based on these findings, the role of post traumatic arthropathy seems central in determining the unsatisfactory clinical outcome. In the present case series, we reported an incidence of 51.9% of post-traumatic OA, followed by 25.9% of ON, 18.5% of mal-union, and then lower figures regarding wound complications and surgical site infection. These findings stimulated us to look at the literature to understand the role of complications after surgical treatment of displaced talar fractures. We were able to find a correspondence between our data and those reported by other clinical trials published in the last three decades: our hypothesis was that ON was not the major candidate for poor outcome, which should instead be ascribed to OA, and literature supports this proposition. Moreover, the presence of radiografic ON can be clinically silent or pauci-symptomatic, whereas OA has a tendency to be more clinically aggressive and limiting for the patients. Based on these premises, the clinicians should be aware of the necessity of properly inform patients about the high risk of complications’ onset, especially post-traumatic OA, that could require further surgery (in our series 4 patients – 15% of total – underwent fusion procedures before the final evaluation). Under a surgical point of view, when approaching a displaced talar fracture, it is of utmost importance to achieve an optimal reduction, which is not always possible due to the presence of comminution or concurrent severe soft tissue injuries. By the way, even in case of a technically satisfactory surgery, significant complications may occurr: overall, displaced talar fractures represent a complex scenery, requiring careful monitoring during following years [35Tenenbaum S, Stockton KG, Bariteau JT, Brodsky JW. Salvage of avascular necrosis of the talus by combined ankle and hindfoot arthrodesis without structural bone graft. Foot Ankle Int 2015; 36(3): 282-7. [http://dx.doi.org/10.1177/1071100714558506] [PMID: 25377390] ]. Our clinical trial is affected by major flaws, that are also quite common in the rest of available literature: the retrospective design, the small number of patients included, the middle term evaluation and the lack of seriated sequential imaging. This limitations foster high quality further research in the field of talar fracture: the main goal of the present study, which includes our clinical experience and a survey of the published evidence, was to raise awareness on what to expect by surgeons and patients following a displaced talar fractures. Future well- designed, prospective trials should aim at identifying potential prognostic factors that could be addressed to reduce the rate of post-op complications. The present retrospective trial highlighted that displaced talar neck fractures are challenging to treat and the outcomes at middle term are poorly satisfactory. Patients should be properly informed about the risk of serious early and delayed complications, that could compromise clinical results. With regards to complications’ rates, data from our case series and the evidence coming from the available literature (16 clinical trials) were comparable, and confirmed that the most common complication at middle term evaluation was by far osteoarthritis, followed by avascular osteonecrosis. No funding source to be declared for the present manuscript. Buza JA, Leucht P. Fractures of the talus: Current concepts and new developments. Foot Ankle Surg 2017 Apr 24.. pii: S1268-7731(17)30086-3. doi: 10.1016/j.fas.2017.04.008. [Epub ahead of print] Review. PubMed PMID: 29409210.